Happy Monday!!! It's Mindy from Mindy Eggen Design and I am thrilled to be back guest designing with Gerda Steiner Designs this month! Here is a look at the set of my colored images. How stinkin cute are these?! 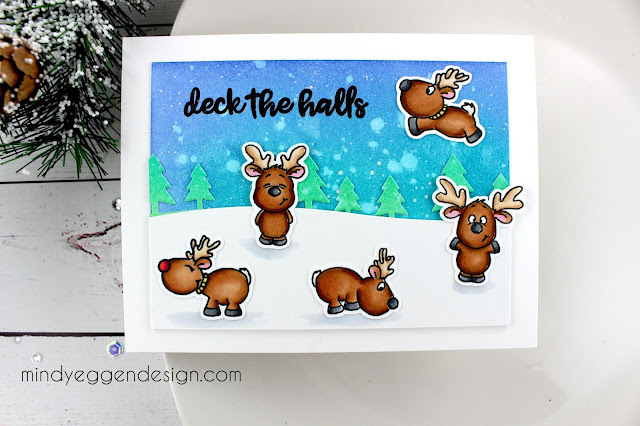 I was having so much fun that I was able to create TWO cards with this set AND bonus for you - I have a video for them! You can view it down below on my blog or over on my Youtube Channel HERE. Supplies will be listed at the bottom of the post. I started my whole process by coloring the entire stamp set. 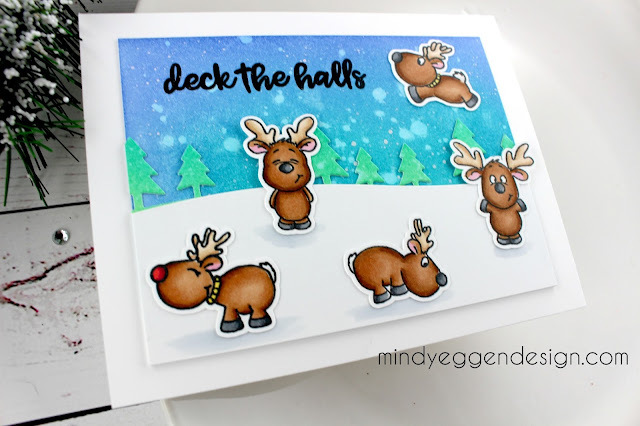 I used Neenah White cardstock and Simon Says Stamp black ink. I used my Scan n Cut to cut out the images. For the background for my first card, I used Peacock Feathers and Blueprint Sketch Distress Inks. I also inked up a piece of cardstock with Cracked Pistachio, Twisted Citron and Lucky Clover and die cut the trees from it. I added a snow hill under the trees, trimmed my distressed piece down to 3 3/4" x 5" and added that to an A2 size cardbase. I lined up where my reindeer would go and stamped my sentiment. 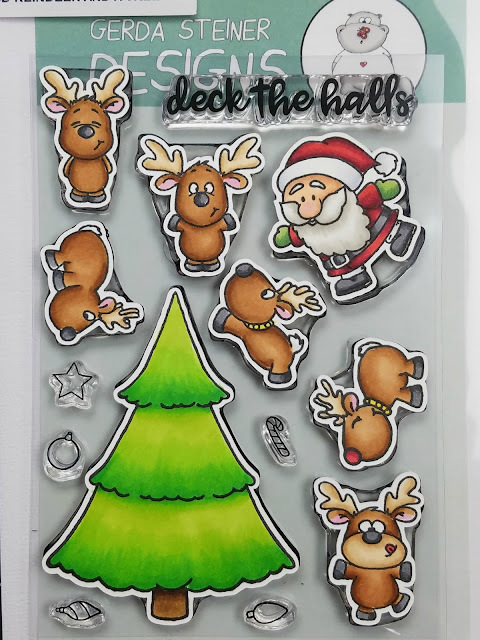 Before I actually added the reindeer, I added a little bit of C1 for shading right underneath them like they are casting a shadow. My second card is pretty similair to the first. I ink blended Wilted Violet, Worn Lipstick and Blueprint Sketch for my sky. I used a Stitched Hillside die to create the hills and adding a sentiment before adhering everything together. I also added shading under my images for this card as well. For a complete supply list you can visit my blog Mindy Eggen Design.